Compare Peter Drucker’s remarks to Mark Driscoll’s. Does “organized abandonment” equal “blessed subtraction”? This is the question we will be addressing in this post. Peter Drucker, the management guru, made his statements in an essay in an October 5, 1998 issue of Forbes magazine, which was re-published by Leadership Network in December 1998 in its glossy newsletter NEXT. 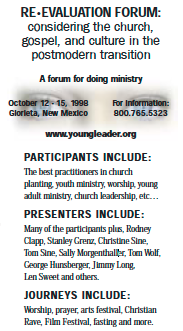 NEXT was a training tool for the young emerging leaders as well as the megachurch pastors. 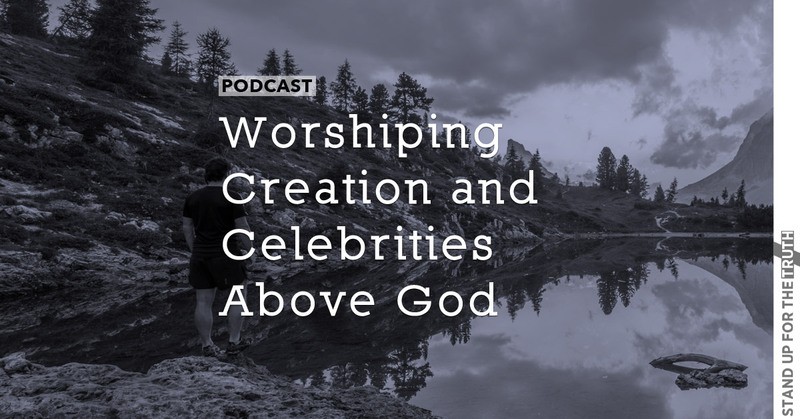 The current context is the recent unfolding revelations about Mark Driscoll and his controversial activities. In addition to Driscoll, the past year has brought to light disturbing revelations about the misbehavior of other men of influence including as Doug Phillips, Bill Gothard and C.J. Mahaney. Suddenly there is an unprecedented openness, a sincere searching, and a willingness to examine controversial issues. Many are trying to make sense out of what has happened. Before proceeding, a word about why this post is being written, and what gives us the right to comment on the unfolding Driscoll crisis. First, it should be pointed out that the Driscoll situation is more far-reaching than just the Acts 29 or Mars Hill Church networks. Driscoll’s vast influence has impacted evangelicals all over the globe, and his subsequent misbehaviors that have come to public knowledge this past year are also far-reaching. In other words, there is considerable collateral damage and all of us are feeling its effects. Second, we write from our own experiences. During the past three decades we have had similar experiences of being treated “anonymously,” shunning and “blessed subtraction.” These painful events drove us to research. We wanted to know what happened to us, and wondered why the same hurtful things were happening to our friends. We began to write about our research findings, beginning with a 2003 monograph “The Pied Pipers of Purpose,” which was specifically about Peter Drucker’s ideology and influence upon the prestigious organization Leadership Network. When this blog was launched in 2005 we began to publish our research on the Internet. In particular, we began to write about how Leadership Network had fostered the rise of the megachurches (Rick Warren, e.g. ), and facilitated the rise of the emergent/emerging, Missional and Neo-Calvinist movements. We wrote a multitude of posts about Leadership Network. Since the Mark Driscoll saga has unfolded, more early history has come to light. We have come to realize that our extensive research might help shed some light on what has transpired. We believe that by placing his beliefs and his actions into the entire SYSTEM and CULTURE devised by Leadership Network, there may be a broader context in which to answer the many questions that have arisen about how this could happen. Leadership Network gave birth to Driscoll, and even now its handiwork is evident in how Driscoll’s crisis is being “staged-managed” by a PR firm. The process of transformation itself has always been our chief research concern. We had experienced this process firsthand. We were trained in it, even experimented upon, during the 1970s when it was in its formative years. We discovered that we had been damaged by this process, although we never used the term “abuse.” We had been put through intensive re-education and indoctrination methods, with rewards for compliance and penalties for failure, and it left us with scars. The purpose of this process was to make us believe that black is white, and we were being trained to use these same methods on others. We admit that we really didn’t know at the time what was happening to us. It was subtle and it was seductive. But we could feel its damage to our faith – our walk with Jesus Christ, our devotion to Him alone, our desire to submit to His will for our lives. Our experiences with these change processes caused us to seek the Lord more earnestly and begin to ask questions. We admit that we often found it necessary to repent for our own complicity, our cooperation, our actions, and especially our silence. 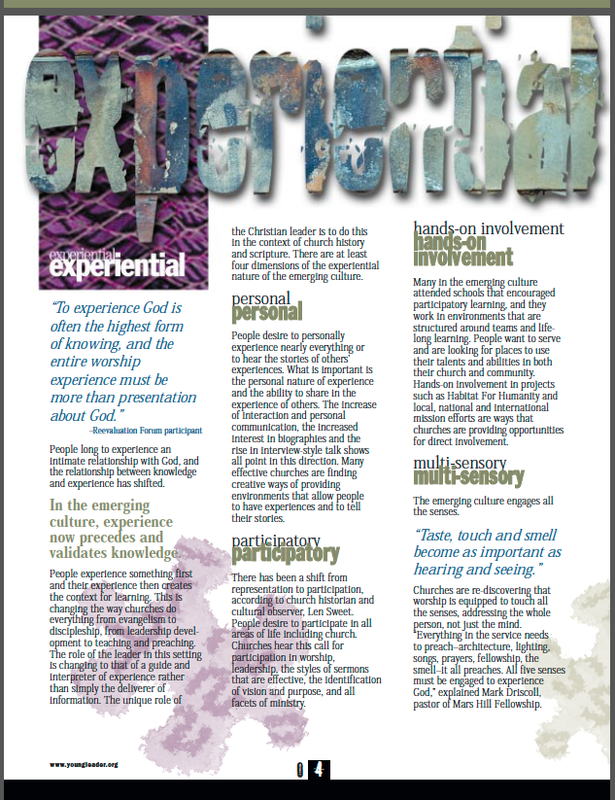 When this experimental/experiential process came into the evangelical church world in the late 1970s, we recognized it. We knew it firsthand. We knew not only the psychological damage it could cause, but also the grave spiritual harm. We knew its allure, and at every turn we found ourselves tempted all over again. We had to make hard choices – sometimes in very difficult circumstances – to go against the flow, to resist the process, to flee (literally in some cases) compromising situations where we felt the lure of entanglement. 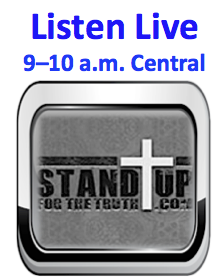 As a result of our non-compliance, we experienced ostracizing, shunning, name-calling, mocking, ridiculing, etc. These experiences, while painful, strengthened us in the Lord, and caused us time and again to run to our Bibles, to seek the Lord through prayer, looking for answers, repenting when necessary, and seeking the Lord’s solace. 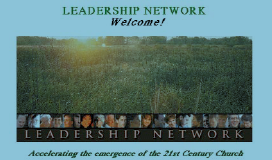 We knew from our own personal life experiences and research that Leadership Network had devised a complex psycho-social process and marketing methodology to transition pastors and other leaders into an alternative spiritual worldview, a worldview which was openly referred to as both Postmodern and Mystical. Leadership Network intended to transform how its leaders would interact with the future, even including the governance of the planet. In this sense it has consistently advocated for a structural change to transition the church into a global society. In sum, there was a two-pronged agenda: mystical utopianism and structural totalitarianism. Dialectically these two could be maneuvered in such a way as to effect Postmodern Transformation. The “deconstruction” agenda, NEXT, Jan-Mar 2000. But how to get the church to “buy into” this radical change? 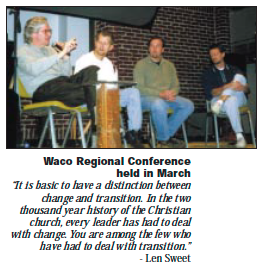 First it required retraining pastors, specifically megachurch pastors, to be the “change agents.” These men were taught to wield a sophisticated marketing model, which would would ultimately reframe the entire Gospel of salvation, and change mission(al) work into a global marketing strategy based on numbers of “converts” (“customers”). Leadership Network employed misleading methods of “deconstruction” to tear down the old paradigm (the Gospel and traditional churches) and experiment with “innovation” in the new paradigm. The Emergent/emerging movement followed closely upon the heels of the megachurch empires. It was a savvy way to jumpstart the paradigm shift to Postmodernism by using a group of hand-selected, carefully groomed, youthful “change agents.” To this day, we remain concerned that these young men, who were so carefully coached to go on the emerging/Emergent dog-and-pony-show, may not have been fully aware of the process they had been put through (just as we were not originally aware in the early 1970s). We continue to pray for these men, that they will begin to ask the same hard questions we asked, and face the harsh truth that not only were they perpetrators, but they themselves may have been victimized by the process. 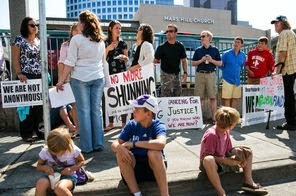 Dozens of demonstrators picketed outside Mars Hill Church in Bellevue on Sunday, with some former church members calling for the resignation of the megachurch’s charismatic founder, Mark Driscoll. The church Driscoll founded started as a Bible study class in his rented Wallingford home in 1996. Today the church says it has 6,000 members and some 13,000 attendees in 15 locations in five states, including 11 in Washington…. Part of what sparked Sunday’s protest was a video posted for church members last week in which Driscoll said he could not address some members’ discontent in what he called a “season of learning” because the complaints were anonymous. Frances Hesselbein, another management guru, has also elaborated on the concept of the necessity of “planned abandonment.” Ms. Hesselbein, who was a colleague of Peter Drucker, was the chairman of Drucker’s Leader to Leader Institute, which she co-founded with Bob Buford of the Leadership Network. Her ideas and materials were used by Leadership Network in training its leaders. What is Hesselbein saying?! This means “abandon” has a broader meaning than simply getting rid of programs. She is advocating “challenge the gospel.” Hence the overall goal of deconstruction of the faith becomes very evident. “Discarding” or “abandoning” church “programs” means that people are going to be affected one way or another. Each program or ministry that is abandoned may adversely impact lives. Obviously Drucker’s original remarks have now been translated into a rationale for getting rid of people who are part of the old paradigm and perceived as standing in the way of transformation over to a new paradigm. These people are going to be tossed off the bus, and maybe even run over by it. How did Leadership Network’s ideas shape the culture(s) that gave rise to Mark Driscoll and other leaders? How have Leadership Network’s ideas impacted the marked reticence of esteemed evangelical leaders to refrain from speaking out and intervening before these fiascos unfolded? What sort of peer-driven culture did Leadership Network create? Is it cult-like? 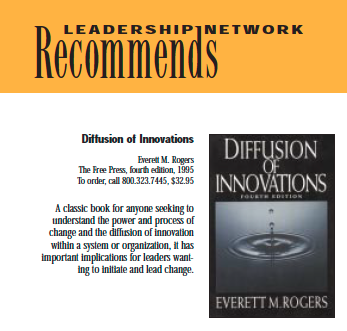 The answer to these disturbing questions may lie in the marketing method that was adopted by Leadership Network: Diffusion of Innovation. There is a long and fascinating history about this method, and someday in the future we hope to write more about it. But here it is in a nutshell. As you look at the graph, you will see that it is a bell-shaped curve. The goal is to shift the bell curve (paradigm) to the right. To shift it, one must identify the “Innovators.” These are the salesmen. In our current discussion, this would have been the core group of early emerging/Emergent leaders, of which Mark Driscoll was a key member from the mid 1990s onward. 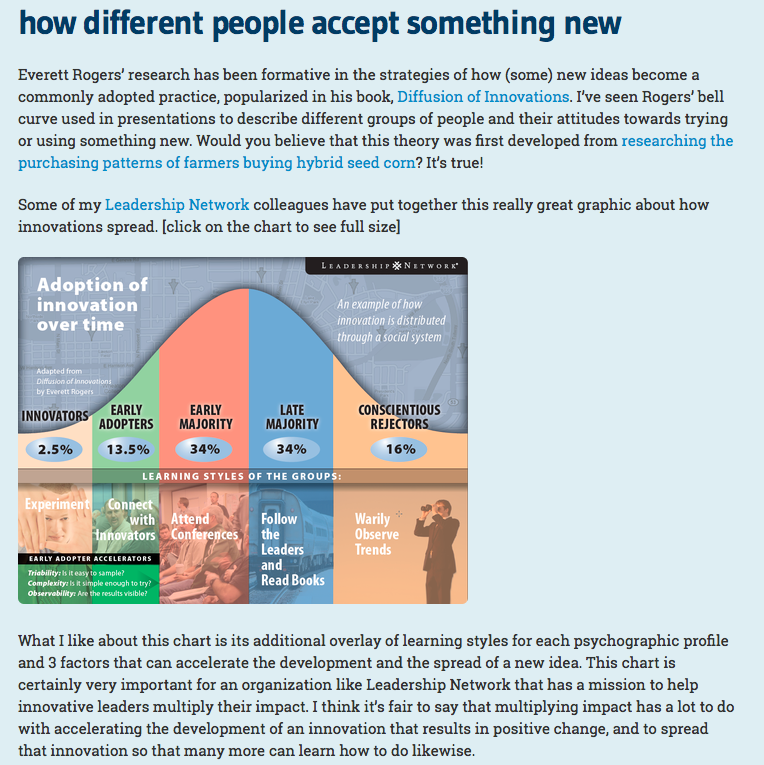 Leadership Network sought “Innovators” and “Early Adapters,” leadership-types who would go along with the newest, hippest thing and were willing to help market it. By the time the “Early Majority” people are brought on board, the paradigm is well on its way to shifting. The “Late Majority” eventually come around. But at the tail end are “Laggards,” those people who resist the change for various reasons. It is most likely the “Laggards” who are the ones that experience being “abandoned.” If you don’t hop on the postmodern bus, you are likely to be left behind at the station. 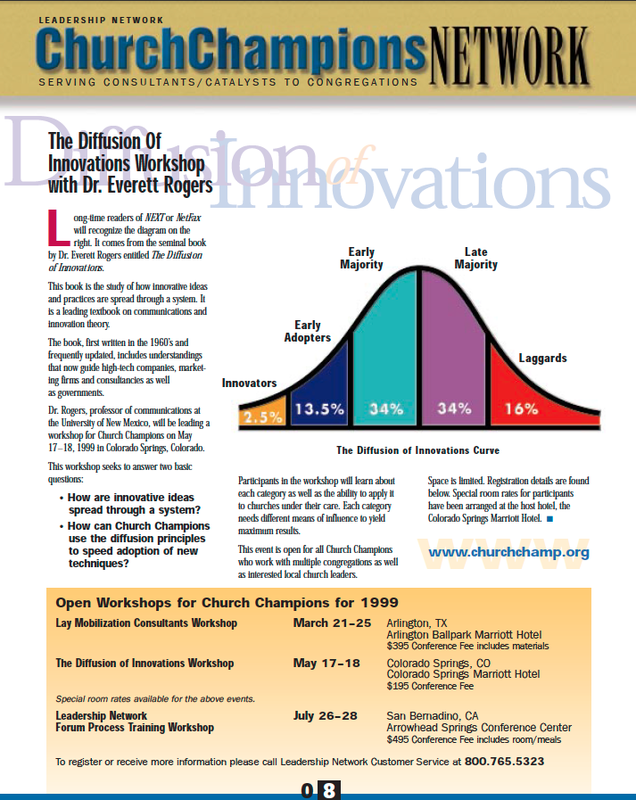 This Diffusion of Innovation marketing method has become a substitute for the Gospel of Salvation. In this model, numbers count, hence the focus on megachurches. This is a peer-driven model, which makes it far more potent. The salesmen propel the paradigm forward via the effective power of peer manipulation. 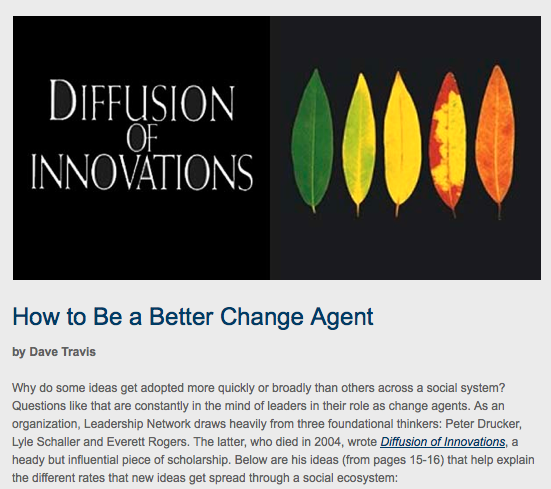 And it requires “change agents” – superstars – who jumpstart the process and set the new paradigm in motion. And all we like sheep follow these leaders…. But where are they leading us? Leadership Network put the Young Leaders through intensive training and indoctrination. 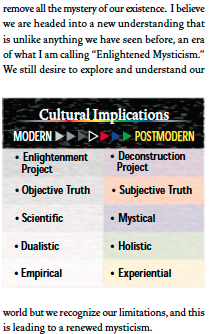 In this Postmodern paradigm shift there are three stages, beginning with Tradition, progressing through Transition, and ultimately into Transformation. Transformation occurs when all of the barriers of resistance have been broken down, or discarded (abandoned? ), and the new paradigm has totally taken over. 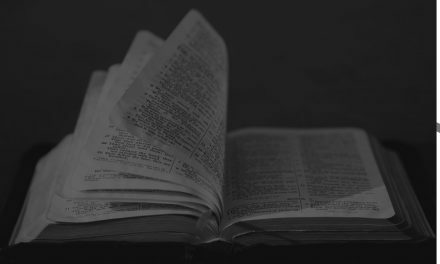 Many evangelical churches underwent this process in the past several decades and we wrote an in-depth series of blog posts describing how it works. A key facet of the “Transition” stage is that people must “abandon” their moorings. This is most easily accomplished by “abandoning” Tradition. This means calling everything about Tradition into question, and pushing the boundaries of propriety and acceptability to the limits. So, for example, when Mark Driscoll performed his “cussing pastor” routine years ago, he was pushing the envelope of Tradition, which desensitized people to the outrageous, and neutralized their consciences, thus putting them directly into the cognitive dissonance of the “Transition” stage. Reports (and statements of repentance) coming out of this experience reveal that people exposed to Driscoll’s various misbehaviors underwent this process to get them to accept this bad behavior as the “new normal.” Note that in order to do this they had to disregard (abandon?) Traditional authority, i.e., Bible verses (God’s Word) that state that profanity is a sin, e.g. 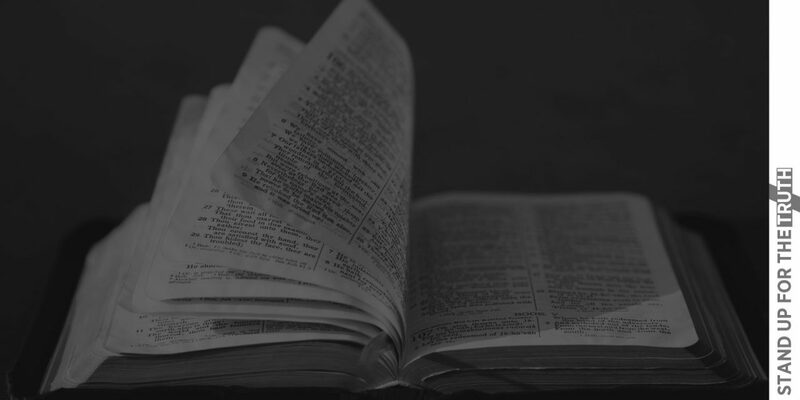 Ephesians 5:4 “Neither filthiness, nor foolish talking, nor jesting….” In sum, the Transition stage is evident when one observes the “abandoning” of the authority of the narrow-way Gospel doctrines found in Scripture. Thus Transition is the bus route to the wide way. Beware. People in Transition are often put through touchy-feely emotive states in which their focus shifts over to “felt needs” and “experiences” as their source of inspiration and authority. It isn’t what the Bible says, it is how one FEELS about what the Bible says that counts. This is the new authority. If peer pressure and subtle proddings don’t work to propel the paradigm shift forward at this stage of Transition, then negative peer pressures may be called in – an array of odious tools such as mocking, ridiculing, scorning, abuse,… even threats. These soft-core types of persecution are extremely effective. There is a biblical transformation of the mind, leading to the desire to fulfill the “will of God.” And there is the paradigm shift kind of Transformation which, when it is full-blown, abandons absolute Truth. Leadership Network set its sights upon a total paradigm shift into Postmodernism. This was not a hidden or veiled agenda. It was openly espoused and taught. The men under Leadership Network’s tutelage were simply taught HOW to move it from here to there. Driving lessons. And how to persuade others to go along for the bus ride. Marketing the trip as a great new adventure into unknown territories was a brilliant strategy. 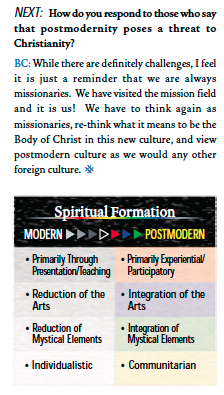 In fact, the Postmodern expedition was so far removed from traditional orthodoxy as to employ leading New Age gurus to help facilitate the uncharted spiritual journey “Off the Map” (See “Christian leaders go on “expedition” with false prophets: Circa 2000″). To propel the paradigm forward, Leadership Network employed the dialectic process. Two steps forward, one step back. By maneuvering opposite points of view, trained leaders can surge forward at the earliest opportunity and strategically shift the paradigm. Therefore, any counter-movements (whether planned or incidental) are perfectly situated to propel the momentum forward. Thus critics (such as apologists and discerners) have often learned, to their dismay, that their arguments against such Postmodern shifts actually fueled the bus ride. In Postmodern dialectic arguments, most often staged or contrived, the various streams of Leadership Network often argue with one another about whether their favorite facet of Postmodernism is tinged grey or rosy grey, or maybe has a little mauve. Another method of bus propulsion was breaking down the overall Postmodern Paradigm shift into marketable segments. Each handpicked leader, destined to fame and fortune, was equipped with a “brand name” – a logo of sorts – an identifying trait that would characterize their unique “market share” in the “Young Leader Universe.” Thus brand name recognition became an integral part of the stardom aura and mystique. Meanwhile the “New Calvinists” and “Missional” streams (seemingly operating their own exclusive bus lines) took a different tack on the paradigm shift – away from the simplicity of the Gospel of Salvation towards the new gospel of building the “Kingdom.” (For an example of this switch, watch the video of Leadership Network’s Eric Swanson HERE.) Despite their pretensions to orthodoxy, these two streams (“market shares”) would also be led by “change agent” superstars, men who subtly erode doctrine with fine-tuned deviations from Tradition. Their composite and ultimate agenda is to propel forward the paradigm shift into an emerging global culture. 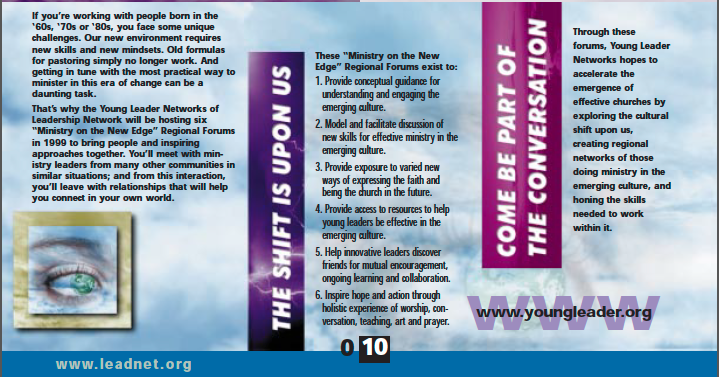 Their churches/networks are being positioned to become “change agents” for global governance. Thus is it no surprise that these leaders have not spoken out as a conscience, nor have they been a prophetic voice. (This is most evident with the Driscoll and Mahaney crises.) Notice that Driscoll appeared to jump ship from the hip emerging/Emergent stream over into the New Calvinist stream, an act which served dialectically to bring the two streams together. Clever strategy! This spelled out much of the agenda for the next decade. To accomplish these designs, the structure of networking was employed. Networking is the Devil’s workshop. Networks are designed to circumvent and supersede traditional structures such as denominations. Networks can superimpose themselves invisibly on top of existing structures, and by subterfuge and/or sabotage destroy traditional models. This is referred to (offensively, at least to some of us) as the DNA of an organization. The network transmits the organization’s DNA downline to clusters and cells, and across (horizontally) to other networks. Networks operate through secretive means, not openly, not through representative forms of government with the people’s voice or vote, and not via traditional hierarchical structures. Rather, networks operate without oversight and control. Thus, the overall Driscoll situation, and how it has been stage-handled, gains clarity. In fact, it has been alleged that Leadership Network operates like a “good old boys club” (even though it now includes some token trained women). 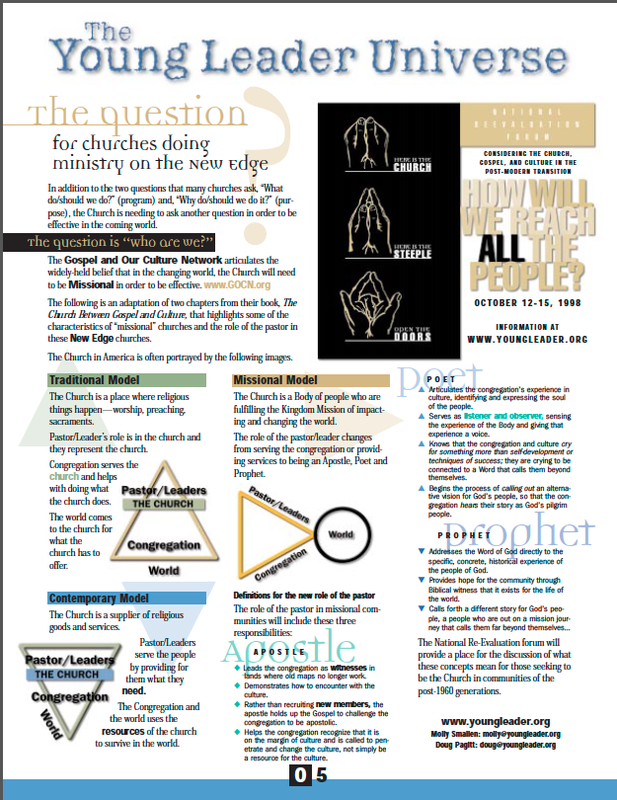 Throughout its murky history it has operated like a secret society of the initiated elite, and even to this day none of the leaders have divulged the full extent to which they were trained to be “change agents.” Its leaders continue to operate in a clandestine manner to maneuver and massage church Transformation via psycho-social marketing mechanisms. We have prayed for over a decade that one man of courage and conviction would come out of this cult-like atmosphere, step forward and “tell all.” May God help him! Networking is also a marketing tool. So given the networking STRUCTURE of the churches, it isn’t a surprise that network marketing is utilized with maximum effect in this massive initiative to re-brand evangelicalism into a Postmodern movement. Below are some examples of how Leadership Network is currently marketing this marketing method. Where can you place yourself on this graph? 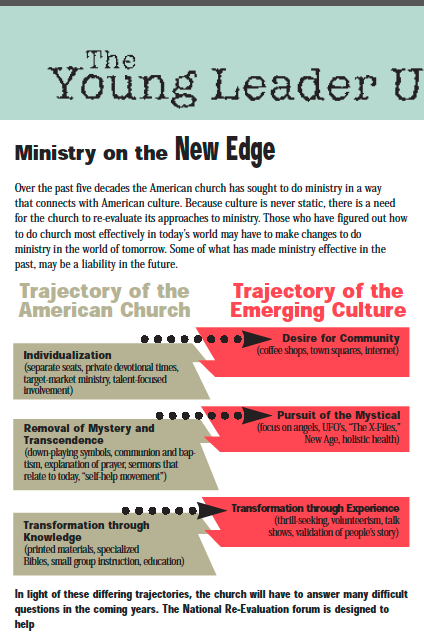 Where is your church in this process of Transformation? Note that rather than the term “Laggards, the term “Conscientious Rejectors” is now employed. 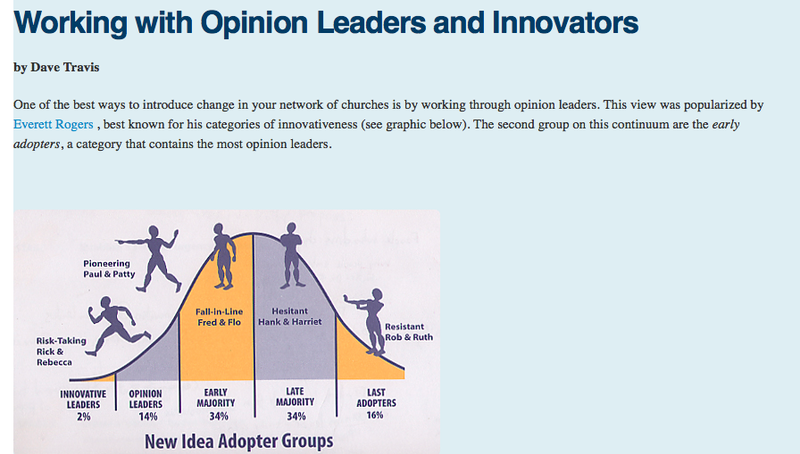 Note also that you (the person sitting in the church pew) are part of a “psychographic profile,” and that the stated goal is to “accelerate the development and spread of a new idea.” Just precisely WHAT is this new idea being promulgated (marketed)? What happens if you are not receptive to it? You guessed it! You’re labeled a “Laggard”! Keep in mind that this is not a grassroots initiative. It is top down. This “new idea” comes from on high and it is being directed AT (marketed TO) your church with the goal that you buy into it. You are the “customer,” as Drucker liked to remind everyone. And you must “buy into” (agree with) your church’s “mission, vision and values” statement – which for the most part, throughout the evangelical world, originated with Leadership Network and Peter Drucker. In other words, your church’s mission statement was likely pre-canned, pre-digested, and regurgitated to the people in the pews as if it were your leadership’s own unique vision. We’ve heard this story many times. These offensive categories may explain how your pastor was trained to identify and label (and stigmatize) you. It may even explain why you were IGNORED when you went to his pastoral office to discuss your concerns about your church “transformation.” Halleluia! Welcome to the Abandonment Club! This paradigm shifting is designed to move you from Brand A to Brand B. What precisely is/was Brand A? It is the old Traditional churches, with their old structures, old programs, old doctrines and old practices. The Emergent/emerging leaders were correct about one thing: sometimes these old things were ineffective, inefficient, insupportable and dead weights. These leaders seized upon the weaknesses of the churches. But where these “change agent” leaders went astray was throwing the baby out with the bathwater. They tossed out anything Traditional whatsoever, especially including Gospel doctrine. In case there is any doubt about this Postmodern agenda, check out the exhibits in this post. Keep in mind that what seemed shocking years ago when these NEXT newsletters first came out, now seem almost “normal.” This is evidence that the paradigm shift has already taken place. The launching of Brand B raises hard questions. 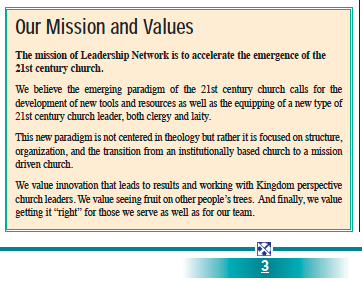 How has your church been impacted by Leadership Network’s stated “Mission and Values”? 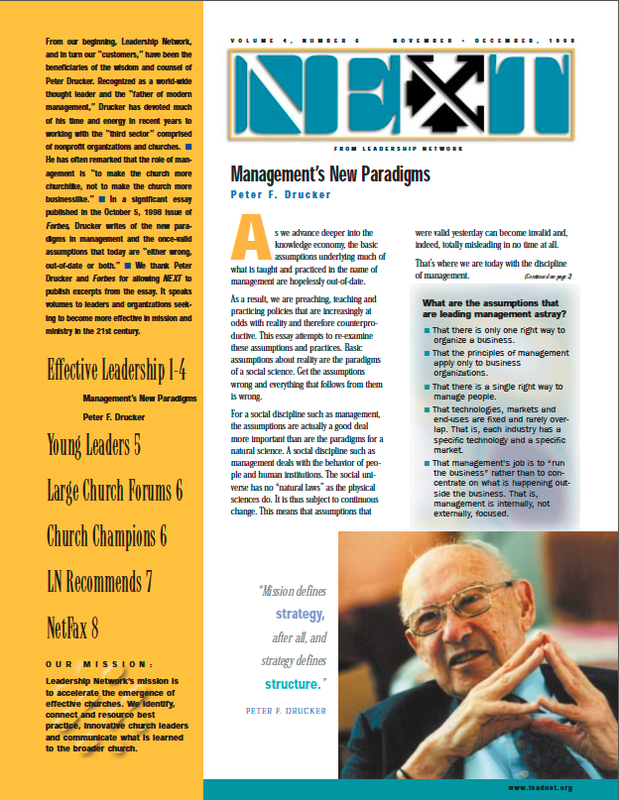 Is your church’s “new paradigm” centered on “structure” rather than “theology”? Chances are, your pastor has been trained via Leadership Network. Or, even more likely, he may have been trained via your denominational structure leaders who were trained via Leadership Network. Either way, your church most likely has been infected with the leaven of the Leadership Network DNA. Oh, and one more thing. Bear in mind that the easiest method to get people off the bus was to turn up the music on high volume. 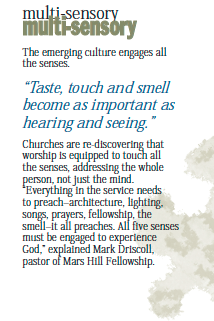 Rock ‘n Roll churches with new worship styles. This technique guaranteed that nearly an entire generation of older folks would get “abandoned.” How many precious saints wept as they told us their sad stories, people who devoted entire lives to ministries in their church, got married, raised families, taught Sunday School… only to find out that they no longer had a voice that could be heard. Abandonment is very lonely and very scary for those who no longer possess the resources or skills to adapt to changes. And we haven’t even begun to discuss Leadership Network’s multifaceted conference circuit(s), carefully tailored (market-niched) for each one of their streams of influence (networks). Nor have we said anything about their publishing empire with its tentacles everywhere. Nor have we talked about the multitudinous other entities, nonprofits and organizations that all network with Leadership Network to further the expansion of its agenda across the globe. And we haven’t scratched the surface of who funded all of this… or what THEIR agenda is/was. He who pays the piper plays the tune…. But think of this is as a blessing. Those of us who have previously experienced this form of rejection can attest to the wonders of God’s workings. He so cared about us that through His grace He permitted us to be “abandoned” by false shepherds so that we might diligently look for the True Shepherd, his Son, Jesus Christ, Who will never leave us nor forsake us. You are not alone. Others have been abandoned with you. The Lord is with you. And who knows? If the Lord tarries, and if we gain courage, perhaps even this day, the Lord may give us strength to proclaim the Gospel of Salvation with clarity and forthrightness, without deception and guile. And there will be those who are Lost who will hear the Gospel’s clarion call, and respond to the message that offers true hope, true redemption and true salvation. 1. 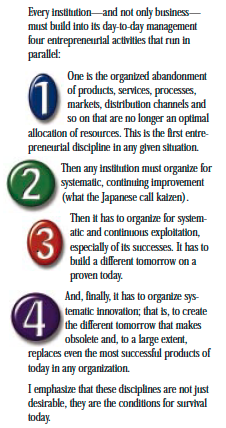 Peter Drucker, “Management’s New Paradigms, NEXT, Leadership Network, Vol. 4, No. 6, Nov./Dec. 1998. What is reproduced here are his bullet points. Note the word “abandonment” in his point 1. 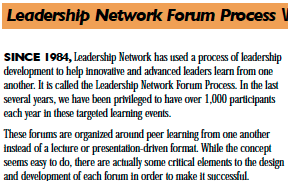 For other articles about Leadership Network on Herescope, google it with a term such as “Peter Drucker” or “Rick Warren”. One link usually leads to many others. 7. For example, the Herescope editor, Sarah Leslie, published the deliberate dumbing down of america by Charlotte T. Iserbyt, a massive research tome compiling the extent to which these psycho-social machinations had become part of the U.S. education system the past 100 years. 8. At a future date we may explain more of our own experiences with Leadership Network and/or the churches that we left due to its influence. It was these experiences that led us to pursue scholarly research in hopes of understanding what had just happened to us. 15. Emphasis added. This quote can be found on page 25 of our monograph “The Pied Pipers of Purpose.” It is from “A Passion for Performance: Peter Drucker’s gospel of accountability,” http://www.philanthropyroundtable.org/magazines/1999/march/interview.html. We note that abandoning programs that “do not produce results” has a specific meaning in the Drucker universe. He advocated “effective” performance objectives that could produce measurable results – a works-based system of assessing and managing people. This effectually “abandons” those people who cannot perform up to par, or it abandons them via stopping programs that may serve a very narrow range of their special ministry needs. 22. We ran an entire series about the network marketing going on in the evangelical church world. It is quite an eye-opener and may help to explain many things to people.